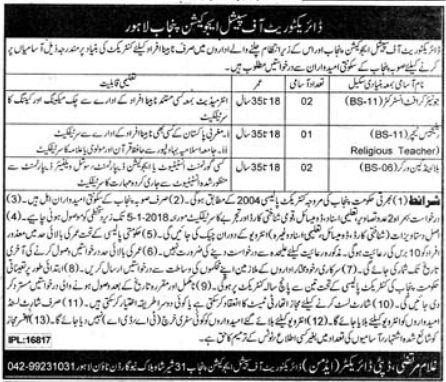 Directorate of Special Education Punjab Lahore 05 New Jobs 22 December 2017, Daily Pakistan Newspaper has announced new vacancies of Junior Craft Instructor (BPS-11), Religious Teacher (BPS-11), and Blind cabin worker (BPS-06) for only Blind Persons who have Qualification equal to Said Criteria can apply for these New Posts. Candidates can send their application at Directorate of Special Education Lahore till 05-01-2018. Recruitment will be as followed by Punjab Government Contract Policy 2004.